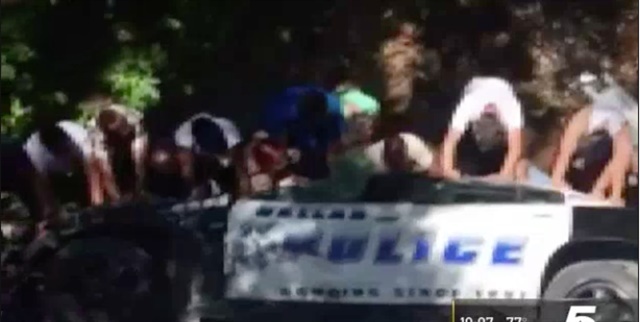 Dallas police are praising a dozen bystanders who rushed to help an officer critically injured Monday when a collision sent his patrol car airborne and then crashing down into an Oak Cliff creek about 30 feet below. Following the crash, video shared with NBC 5 shows nearly a dozen people who scrambled down a hillside and into a creek bed where together they worked to stabilize the toppled vehicle. Police hailed the quick response from the "brave and caring citizens" as inspiring. "The love from our community is truly inspiring," the department said. The officer, responding to a burglary call, was driving at about 2:15 p.m. when a Chevrolet Silverado pickup truck failed to yield and T-boned the squad car, sending the officer's car into Fivemile Creek, police said. Dallas police said the officer, identified Tuesday as Sr. Cpl. Dale Ordogne, was transported to Methodist Dallas Medical Center with critical injuries. His condition is stable, police said. Dallas Police Department spokesman Sgt. Warren Mitchell said officers continue to search for the driver of the truck, who fled the scene after the crash.